Starbucks, Biggby, Dunkin’ Donuts. All brands we know, and recognize. If you’re not building your BRAND, how will customers remember you, and choose you? The stronger the BRAND, the more likely customers will remember, and choose it. 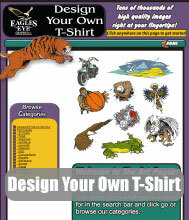 Eagles Eye Graphics can help you establish, solidify, and then build your BRAND in todays marketplace. For over 35 years we’ve been helping companies build their image, and grow their businesses by offering a wide range of marketing services. 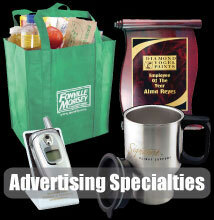 From apparel programs, and promotional campaigns, to screen printing, advertising specialties, and embroidery services. We have the experience, and capabilities to guide you every step of your journey. Please contact us, and make an appointment or stop by our showrooms and we can show you all the latest, up-to-date advancements in products, and technology there is to offer. We’re available at our offices, Monday through Friday from 7:00 a.m. to 4:00 p.m.
We have been using Tim & Eagles Eye Graphics for many years. 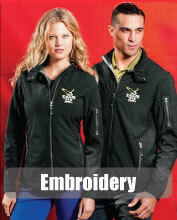 They provide our business shirts, jackets, hats, pens and more. Tim always goes above and beyond to ensure that our orders are correct and received in a timely manner. I would highly recommend Eagles Eye Graphics to anyone looking for the business attire and advertising gadgets to give away to customers. First class company! Kelly Conley, Superior Quality, Inc.
Tim offered a quality product with a great design. The shirts, sweatshirts, and shooting shirts were completed on time and with a cool creative design all of the kids loved. I would recommend using Eagle Eye Graphics to all of my friends and other schools. Tim does a great job. I have always been very happy with the work he has done for us. I always want to save money, yet often when you order the cheapest product online you don't get the quality you can find from a local provider. Tim at Eagle Eye was very reasonably priced with unmatched quality. I especially found his embroidered hats to be above and beyond what I was expecting, and they were sought after by customers, employees, and vendors! Tim has provided me with advertising materials like calendars and pens over the years for my real estate business. He's personable, knowledgable and his prices are fair and reasonable. I've spoken with others who have used Tim's services and they give him glowing accolades. I'd highly recommend Tim if you need advertising specialties, graphic design work (he's a very talented artist), or screen printing. Tim and Eagles Eye Graphics are always a pleasure to work with. Tim is continuously attentive to our needs and prompt to finish our orders. 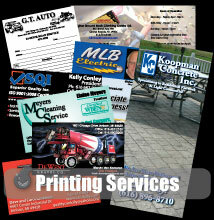 Every time we submit an order, we know that the quality we expect will be met or exceeded by Tim & Eagles Eye Graphics. If you are looking for Graphic Design work, or ways to brand your Company or Image...look no further than Tim Roughey and Eagle Eye Graphics. Tim does outstanding work. His attention to detail and his creativity put him a cut above the rest in his field. His work simply speaks for itself. Call him today! Tim is very knowledgeable in his work. The work was excellent, done like I requested and on time. He is a pleasure to work with, I would recommend him to everyone. Tim has provided excellent service in our community with our band and color guard and winter guard program. He has printed all of our show designs, embroidered our member jackets, designed our state championship shirts, made our vehicle stickers, designed our tumblers and much more. Tim will provide you will prompt service and quality work for a great price. Tim did awesome with our new logo design and great prices! We all really like the sweatshirts! Our orders are ready when Tim says they will be. I will be coming in in the spring for T shirts and hats! Tim designed a corporate logo for us; we were very happy with the results. He performed the task promptly with quality workmanship and at an excellent price. We would definitely recommend him to others. I have worked with Tim on several projects for my husband's business. Tim puts a lot of thought and effort into his designs and it shows in the finished product. He consistently "wow's" us with his creativity and versatility. I recommend him to anyone who is looking for a fresh look and consistent excellence. Tims help in advertising is a must for any business. The hats, pens, and other items are a need for all! Tim has helped me on various projects since I started my business, from work attire to advertising materials to hand out. Tim has always known what to do with my "what do I do" ideas to promote my business. I'm a firm believer in "you get what you pay for" and I've never been disappointed in the products that Eagle Eye Graphics has provided me....I often get compliments on the products that Eagle Eye has made me, and I encourage you to try them out! Tim does top quality work at a fair price. You won't be disappointed! We loved the document holders Tim did for our company. Our clients love them and always comment on them. I have had the pleasure of working with Tim. His industry knowledge married with the need of the client is outstanding. His work ethic and character builds the trust needed to move forward with projects. I have never had an issue with quality, lead times or shipping. It is without hesitation that I give Tim my highest recommendation. I wish all my business partners could match his service. Tim does high quality work for a reasonable price. He is very creative and detial oriented. Tim is a talented artist with a great eye for detail. I would trust Eagle Eye Graphics for all my marketing needs. We want to thank you for making every effort to insure that our working relationship runs smoothly! In our business, service is everything and it is so nice to be able to go from idea, to design, to print all in one place! Doing all this and keeping the cost in line is an answer to prayer! We look forward to many more years with Eagles Eye Graphics as together we continue to serve Michigan cheer teams and coaches!